Have you already proposed he should become such a leader? Note: In flight, the control surfaces of an aircraft produce aerodynamic forces. These forces are applied at the center of pressure of the control surfaces which are some distance from the aircraft’s centre of gravity and produce torque, the tendency of a force to rotate around an axis. 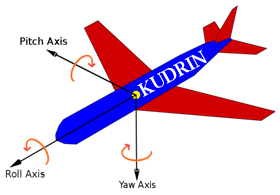 In aerodynamics there are three torques — roll, pitch, and yaw – causing an aircraft to rotate as demonstrated in the picture.